I felt like I had won the lottery because this person standing in front of me, imparting knowledge and molding my brain, was not, in fact, a nun. If there is any portion of schoolgirl crush involved here, it would have been my unabashed curiosity and wonderment about culture and travel, and seeing that he was not shrouded in a habit, or bound by the rules of religious life—I assumed him to be a man of the world. I was rapt. His history lessons and personal narratives related crumbling relics to the adventures and hilarious mishaps he had experienced; like the time he was at an acquaintance’s house in Spain and asking for directions to a café while the woman kept pouring him cup after cup of coffee. When you are in fifth grade, that is the stuff of comic genius. As a full-grown adult and mother to a child on the spectrum, I have found myself chanting this formula as mantra to help us successfully navigate our days. While I have little control over what will greet us once we step into the world, what triggers and fears might be waiting to overwhelm my son, I do have P to the 6th Power. It is my golden ticket to assuming as much control as possible in a world that can be unpredictable, frightening and loud. While we have our challenges and struggles, I still want to give my son the gift that was offered to me: the chance to travel, to learn what it means to be a citizen of the world, so that the colorful map hanging on the wall isn’t just a one-dimensional poster, but a record filled with memories, stories, and adventures. Thanks to airports around the country, new programs, and specially designated rooms are making this travel-goal a reality. This program is so successful that in its first three years, they have hosted approximately 750 participants (children with autism or other I/DD and family members), and, according to Jon, the response has been overwhelmingly positive. Given the opportunity to board a plane for the full flight-simulation experience, children are able to engage with the crew and ask questions so that, if they do find flying is a possible fit for them, there are fewer surprises along the way. This also helps parents who might be questioning the feasibility before investing in tickets. It also serves airlines so they can better adjust their practices and approaches to be more inclusive. This is good news for an industry that has recently been headlined with negative press. As Jon illuminated, “What is less obvious to many people is how these events help airline, airport, and TSA personnel and community volunteers better serve individuals with intellectual and developmental disabilities. Wings for Autism gives aviation professionals and volunteers the opportunity to observe, interact and deliver their services in a structured learning environment. This program is not alone in its inception, and similar opportunities are popping up around the country. For example, Dulles International Airport and Reagan National Airport, host a similar program called “Wings For All.” The Hartsfield-Jackson Atlanta International Airport has created a multi-sensory room, complete with a soothing paint scheme, bubbling water sculpture, ball pit, toys geared to those with sensory sensitivities, and giant beanbags for relaxing. When dealing with the sharp fluorescent lights and loud hum of the crowd, this quiet escape can be an airport lifeline. Similarly, Myrtle Beach Airport, in partnership with Champion Autism Network, offers a “quiet room” experience for children and their caregivers to seek solace, relaxation and a break from the crowded hubbub of the charged environment. 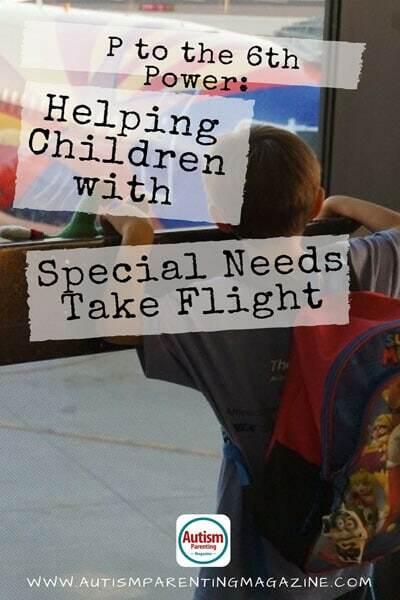 These are just a few examples of airports offering programs and designated spaces to aid children and families with autism, disabilities, and special needs so that what might have been a blurry dream of airline travel can become a vivid photo album or a happy memory. For our family, it gives hope that my son’s disabilities can extend into possibilities. It means that I will not feel as alone in carrying the weight and worry that comes with helping my child navigate crowded and loud spaces, or feel stuck to the close-geography of home. And although it is highly unlikely, I would like to think that it is all due to the genius of my 5th-grade teacher and his magic formula. Megan Merchant lives in the tall pines of Prescott, AZ. She is the author of two full-length poetry collections: Gravel Ghosts (Glass Lyre Press, 2016), The Dark’s Humming (2015 Lyrebird Award Winner, Glass Lyre Press, 2017), four chapbooks, and a children’s book, These Words I Shaped for You (Philomel Books). She was awarded the 2016-2017 COG Literary Award, judged by Juan Felipe Herrera. She is an Editor at The Comstock Review.